Jef Raskin said it was useful code. Steve Jobs said it was contemporary art. You decide. Reposted with permission from Lucas Wagner since the original page is no longer available on the Internet. 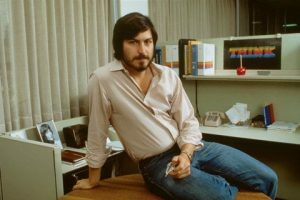 Since I posted this article several years ago on Slashdot, this page has become an Internet starting point for discussing a number of different issues, ranging from “What is your idea of the ultimate geek poster?” to discussions about the turbulent relationship between Jef Raskin and Steve Jobs, the two fathers of the Apple Macintosh computer. One of the things that fascinates people about this project is that it is a tangible byproduct of two great minds, Steve Jobs and Jef Raskin, working together… but not necessarily seeing eye-to-eye. There are few examples of this, aside from the Macintosh, that exist today. The late Jef Raskin kindly edited, clarified, and co-authored this with me, and for this I am grateful. This poster was given to me by my uncle around 1980. At the time, my uncle ran a successful print shop in Redwood City, California. The business, Westwood Press, specialized in high-end, corporate printing. They had an incredibly expensive printing press, imported from Europe, which, I believe, gave them a competitive edge in Silicon Valley, particularly when doing full color, glossy corporate artwork. We toured his facility one summer and I remember a small stack of a few glossy posters he had taken off the press for our tour. 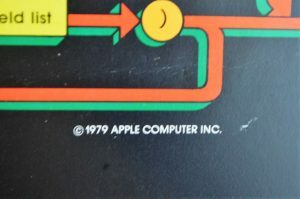 I recognized several to be from Apple Computer, Inc. My uncle, being a generous and cool guy, allowed us to take home several pieces of corporate artwork. To this day, they remain some very interesting artifacts of Silicon Valley in the early 1980’s. Over the years, I became quite enamored with the strange uniqueness of this poster. I didn’t know what it was or how it worked. 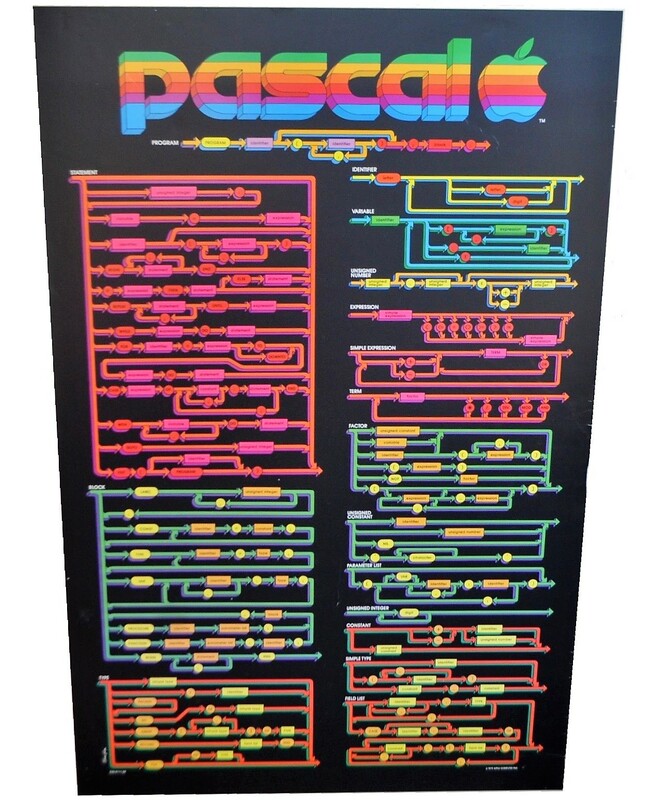 As far as I could tell, it was a syntax chart for a programming language — Apple Pascal. It appeared just as impressive then as it does now because of the raw amount of data contained on it. Over the years of looking at it, I had come up with some questions that I’d found somewhat perplexing. 1. Why do the colors not make sense? The top left portion is dark pink and light pink. On the other hand, the portion to the direct right of it has a variety of different colors. Was this intentional? 2. Why is it on ultra-glossy, thick paper? Most programmer documentation isn’t hung on the wall. This one could be. Is this useful artwork or a programming table? Did people hang it on the wall? 3. Is there a story behind this poster? I have seen poor quality pull-out magazine “geek” posters which have conveyed some very useful data, though I have yet to see a poster strangely similar in both quality and utility as this one. What is the story behind it? I had to do a bit of research to find people who were around at Apple back in 1979. It amounted to sending off a variety of “Have You Seen This?” e-mails. The answer, after firing off a dozen e-mails, came from someone well known in technological circles — Jef Raskin, the father of the Macintosh. 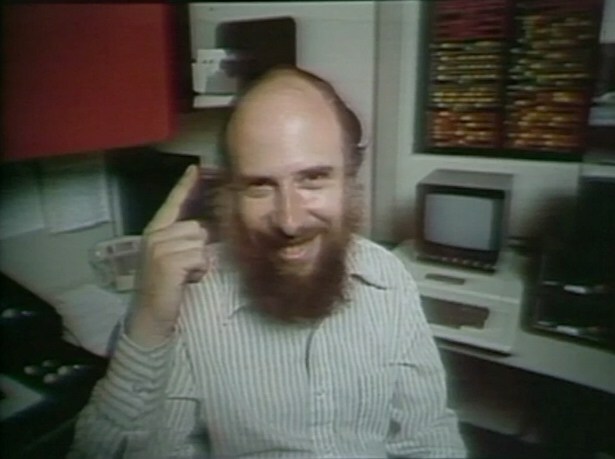 Not only did Jef know about the syntax poster, as head of the Apple publications department, he headed up the effort to put it into production. 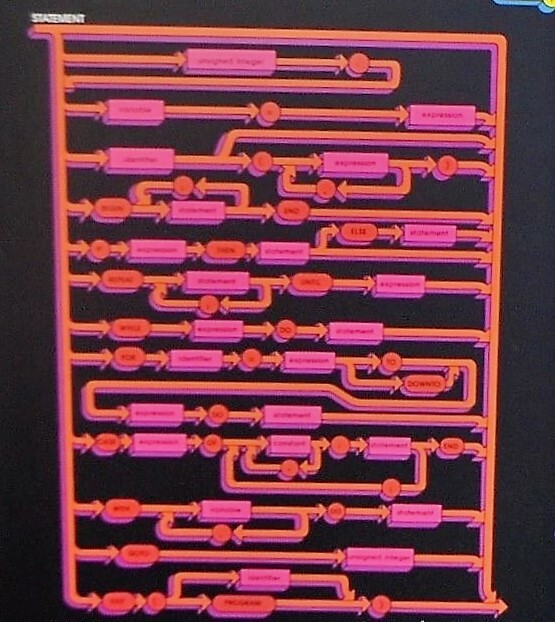 Raskin’s purpose for designing a new syntax chart in a poster format was utilitarian. He found that many of the existing published Pascal charts had errors when applied to Bill Atkinson’s Apple Pascal compiler. Raskin began, using Niklaus Wirth’s original “PASCAL – User Manual and Report” [Springer-Verlag,1974] as his guidebook. Jef Raskin…note the Poster in the background. He fixed the errors, though he found himself making some innovations to the chart. He made organizational changes that made the original chart more useful. As a finishing touch, he color-coded it so that a higher lexical element’s color would correspond to the syntax diagram below that explained it. A poster format was chosen so that the programmer could glance up and have his desk free from clutter. 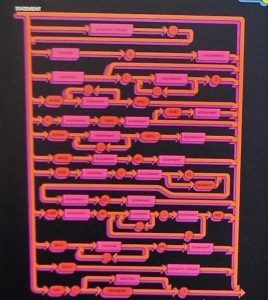 Raskin’s original color-coding scheme made it such that the poster could be glanced at from a desk or from across the room. Interesting idea? Well, it would be a year before Post-It notes were introduced to America, so coding clutter was likely out of control. The syntax poster was clean enough and elegant enough that it would not look obtrusive hanging on a wall in an office. It sounds like a simple story, except for one thing. He had to clear it through Steve Jobs. Steve Jobs. Note the “THINK” poster in the background. My uncle printed that one, too. 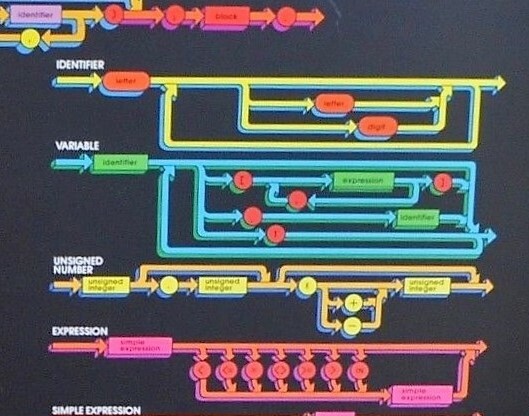 Raskin says that, when he approached Jobs to explain the concept to him, Jobs understood how the flow chart worked. However, he did not fully understand how the colors worked, even though Raskin explained it to him several times. Raskin describes him as being technically hard-headed and difficult to teach. 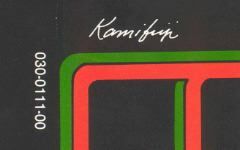 Instead of learning how Raskin’s color scheme worked, Jobs hired an artist, San Francisco’s Tom Kamifuji, who was a hot, up-and-coming artist in the late 70’s / early 80’s. 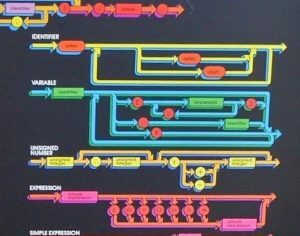 Jobs gave him free reign to make it more artistic, though Jobs failed to explain that the original color scheme was important for using the chart easily. Since Jobs did not understand Raskin’s color scheme, he had an artist alter the work, unfortunately, for the worst. Left side, rigid coloring. Right side, chaos. So, the results feature some strange items. For example, the “Statement” syntax block features a “pink on pink” motif. Jobs’ artist replaced Raskin’s colors with pink-on-pink. And, whereas the Unsigned Number motif is “yellow on yellow”, the Unsigned Integer motif is “yellow on green”. Since the artist apparently did not have a tech background, the poster lost part of its utility. Between the following scans, you can see that “identifier” is colored in FOUR different colors: PURPLE, ORANGE, GREEN, and (not shown) PINK. One could argue that they’re in different “modes” or “contexts” (Jef had famously argued against “modes”)… however, does that really help in interpreting the poster from across the room? reason for this, either. Was the artist was famous (e.g., bragging rights)? Was it for intimidation? Was it just artistic control? Raskin feels that this action was morally wrong. The number 030-0111-00 in the photo, beside the artist’s name, is a standard Apple document number. The 030 means it is part of the technical document series. 0111 means it is document # 111, and 00 means it is revision 0 (that is, the 1st copy). This is actually a rather low document number compared to today’s Apple documents which are in the 5000 range, I believe. According to Raskin, the poster ended up being over the desk of every programmer at Apple and over the desks of many programmers outside of Apple. 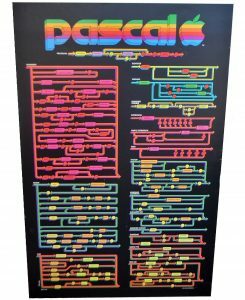 Andy Hertzfeld, another key early Apple employee, added that he also remembers the poster and believes they may have also been given to dealers to promote Apple Pascal. Slashdot reader and ex-Computerland employee Bruce Barrett says Hertzfeld is correct – the posters were indeed given to dealers and also given out to Apple customers.